To be able to easily organise credit, loyalty or business cards, and to offer a different visibility to your design, personalised credit card holders are a must for promotional items. Get custom credit card sleeves to complete your range of promotional items. If you have not already taken advantage of our Printing services for Corporate Gifts & Promotional Merchandise then now is your chance to get an item that is practical and versatile for your office: custom credit card holders. You can offer this product as a gift to new employees, new customers, or even order them in large quantities for a slightly different use at trade fairs and promotional events. Custom credit card holders have great potential to bring you a large amount of visibility because they can be used in multiple situations whenever a card is needed; during transactions, meetings where a business card is given out, for travel cards. 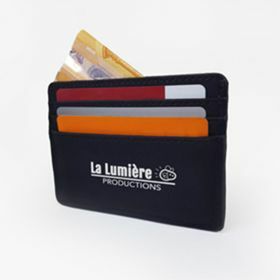 We offer a range of models in different materials such as PU leather, Denim effect, Aluminium, and RFID card sleeves. Whatever your budget, we have something for you, with screen printing and laser printing, all materials can have the best finish for your printed design. With Camaloon, you can completely gear yourself up for your upcoming trade shows and events by making an order of all essential items for your promotions. Taking a quick look at our website, you will find a wide range of products that can be used for preparing yourself, whatever your plans or preferences. Smaller sized products like personalised USB sticks usually work the best as they are easy to get around (making them ideal for bulk orders), as well as being convenient for the people you distribute them to. At any trade fair or event where your staff are representing the company, it is important to look professional, which can be done easily with personalised lanyards, also allowing for your employees to be easily identified and have a professional touch to their outfit.